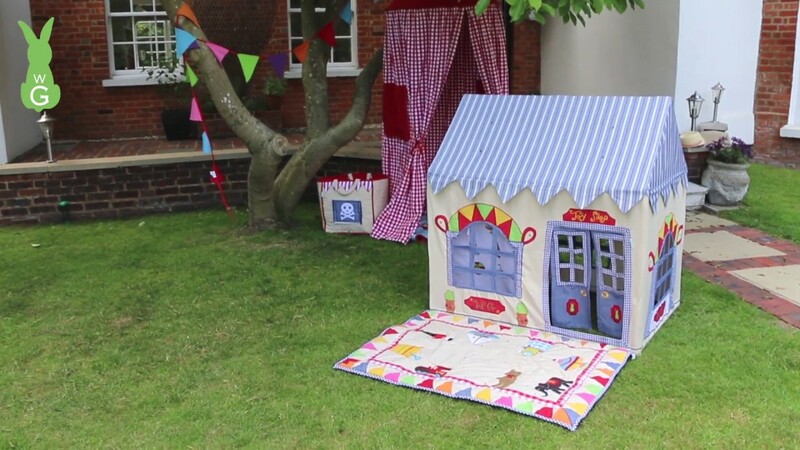 This gorgeous Theatre Play House and Quilt by Win Green is their newest and exciting addition to the Play House range. Believing that children should be encouraged to explore their imaginations through creative play, Win Green’s new Theatre Playhouse with Quilt reflects this ethos perfectly. Their continued desire to create a product which nurtures creativity, inspires imagination and encourages interactive play was their inspiration for this fabulous new Theatre design. So many children love to get dressed-up and put on a show. Making up stories, songs and dances… putting on a performance for family and friends can be so much fun! The possibilities are endless and we wanted there to be a place for each child’s personality to shine, whether they were born to be the star of the show, have us all laughing as the comedy side-kick or take charge as the stage Director! This bright and colourful new design is a real showstopper. Shimmering musical notes flow across the bright yellow roof and little flowers grow outside the Stage Door, where you can wait with your autograph book! Buy your tickets from the Ticket Office and don’t forget to pick up your popcorn and ice cream before the show. The star embroidered curtains tie back to reveal a floorboard-style floor quilt, just what your budding actor needs to tread the boards. So, create the perfect backdrop for your little performer and let the show commence!